Luxury motor yacht 4LIFE is a 26.93m (85ft) Princess yacht, built in 2013. 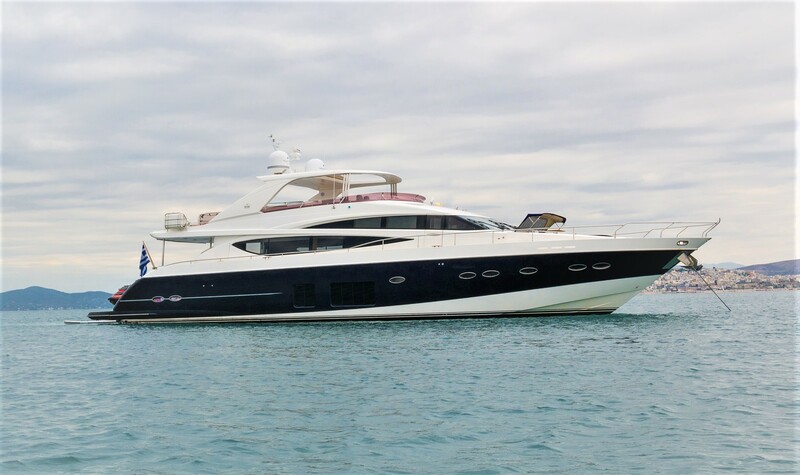 M/Y 4LIFE offers sumptuous interiors with accommodation for up to 8 guest, she boasts exceptional exterior deck areas and has a permanent professional crew of 4. Crewed charter yacht 4LIFE has a contemporary elegant interior. Rich woods and neutral furnishings are refined, yet warm and welcoming. Ample natural light floods the spacious guest areas, creating an open airy ambiance. The salon offers a generous lounge with plenty of plush seating, coffee table and entertainment aft, while forward is a formal dining table, easily seating all 8 guests in style. The foyer on starboard, leads to a day head, steps to the lower deck guest accommodation and pilot house forward. Below decks are 4 guest cabins, each with private en-suite facilities. 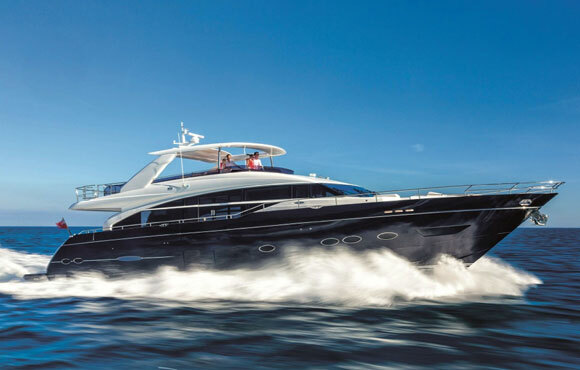 Motor yacht 4LIFE is fully air conditioned for optimum comfort. Exterior living is well-appointed aboard the Princess yacht 4LIFE. The salon leads directly out onto a shaded aft deck, with an alfresco dining option and fitted seating, ideal for entertaining guests. On the bow is a double sunpad, further seating area and table, perfect relaxing, socializing and evening aperitifs. For the active in the group, a hydraulic extended swim platform provides effortless water access to the great selection of sea toys on offer. 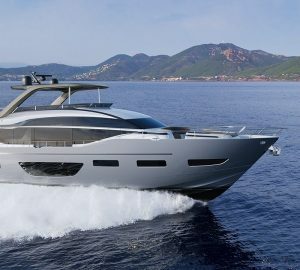 Charter yacht 4LIFE is a flybridge design, offering a spacious upper deck, complete with wet bar, alfresco dining, sunpads and partial shade with a retractable roof top. The flybridge is accessed from either the external aft steps, or the interior spiral stair case in the pilot house. Powered by 2 x CAT 3,850hp engines, 4LIFE is capable of impressive speeds ranging from 19 knots cruising, to 27 knots at top speed. A TRAC digital stabilizing system ensures a smooth charter yacht experience, whether at anchor or underway. Luxury crewed charter yacht 4LIFE offers accommodation in 4 guest cabins, each with private en-suite facilities. The master cabin is full beam of the yacht amidships, with a center lined king size bed, seating area, vanity, walk in wardrobe and large in hull windows on port and starboard. The VIP cabin is forward and full beam of the yacht, with a center lined queen size bed and walk in wardrobe. Two guest cabins each have side by side twin beds, with the option of converting into double beds, upon request. All 4 cabins boast fantastic natural light and a serene relaxing atmosphere.